First, she was the first large wooden boat entirely bonded together with epoxy using no permanent fastenings. While this is common today, it was revolutionary stuff back when adhesives for wooden boatbuilding (including epoxies) were looked upon as a backup to traditional wood fasteners like nails, screws and bolts. Second, Adagio was the first large boat encapsulated inside and out with an undiluted epoxy resin system. 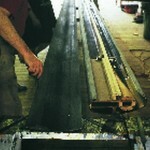 The epoxy we used was the precursor of WEST SYSTEM® Epoxy as you know it today. This again was revolutionary. The conventional wisdom in 1970 was that wood needed to “breathe” in order to function as an engineering material for boat construction. Third, she featured a rotating wing mast, which was relatively new for an offshore cruising multihull in 1970. With a displacement of about 2,400 pounds, Adagio was a boat well ahead of her time. She saw no serious competition here on the Great Lakes until 1984 when my brother Jan launched another 35-foot trimaran, Ollie. Structurally, Adagio was a great success. Her only failures were the usual centerboard and rudder problems that were the bane of the early multihulls. She served as a great family boat, with large trampoline play areas that our many children enjoyed over the years. 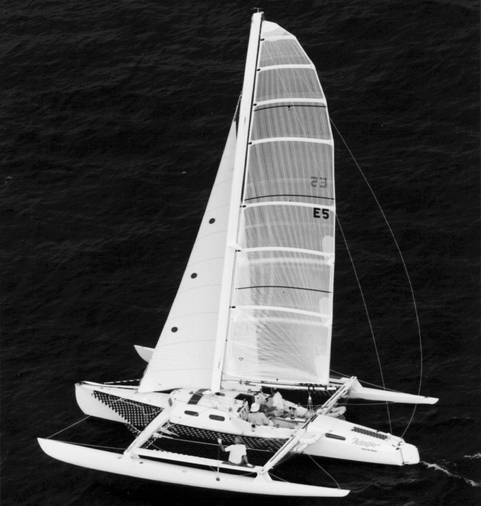 After the 1990 season, we retired both Adagio and Ollie so we could focus on developing the G-32 trailerable catamarans. After being “cooped up” on Lake Huron with fast boats and no one to race, a trailerable offshore racing multihull strongly appealed to us. 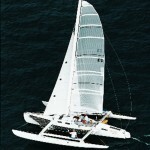 The G-32 proved to be astonishingly fast and very practical (successfully sails at PHRF rating of –12). The only problem was, we couldn’t attain our original price goal of $35,000 for limited production. We built only 14 before discontinuing production. In 1995 a historical change occurred on the Great Lakes. The Bayview Yacht Club opened its prestigious Port Huron to Mackinac race to multihulls, placing them in an “Open Division.” Jan Gougeon won the 1995 race aboard his 35-foot trimaran Ollie. He had dusted her off and re-commissioned her several weeks before the race. I raced a G-32, Janet C., but found that the added weight of required safety equipment, a crew of three and attendant gear made it difficult to sail the low –12 rating. I decided that next year we would race in the larger Adagio. Campaigning a lightly built, 26-year-old trimaran in serious competition was an intriguing but sobering quest. After thoroughly inspecting of all of Adagio’s pieces and parts, we felt encouraged. She’d changed little over the years and showed no signs of undo strain or wear. However, we would need to solve problems with the centerboard area and the wingmast. The centerboard area is one of the most highly loaded areas of the boat. A 7-foot slot separates the boat amidships, and a large case houses a substantial retracting board. Originally, we’d supported this area with a complex egg crate type construction. It had held up for years, but was starting to show signs of weakness. Several groundings had done some minor damage to the interior of the case, allowing moisture into this crucial area. To solve the problem, we replaced the old egg crate structure with a simple carbon fiber laminate buildup on the centerboard case and surrounding hull area. The result was stronger than new and added no weight. The original wing mast had always seemed marginal when pressed hard in heavy air. We’d built it light (120 pounds for a 39-foot mast without hardware) and it had never failed. It may have lasted many more years, but with modern sail technology imposing more loads on a rig, we decided to build a new wing mast. We built the original mast using a fold-up plywood construction technique, which became the basis for many more built since. It is a simple and quick procedure that results in a good product for the time and money involved. However, this time around I wanted to build a state-of-the-art wing mast that would be stronger, stiffer and smaller in section than the original, and weigh less. The original section was 17 inches in chord length with pointy leading and trailing edges, which are inherent in “fold-up” construction. My primary goal was to reduce the chord length to just 12 inches but not give up any precious edgewise stiffness; one of the advantages of the rotating wing mast concept. My other goal was to adapt a larger leading and trailing edge radius. The resulting smaller section would be less adversely affected by wind when moored, or at the dock. A new building method allowed us to accomplish both goals. It was relatively easy and did not require a lot of man hours. Our strategy was to separate the mast building effort into four separate parts; two molded side panels and two more molded sections, one for the nose and one for the tail. We made all four of these parts on two simple, easily fabricated molds. For the nose and tail parts, we used 3-inch diameter PVC pipe. We used a simple, curved plywood mold to make the side panels. To build the nose and tail sections, we used Unidirectional Carbon Tape sandwiched between a 4-inch wide woven 9-ounce glass tape. This allowed us to achieve 60 percent fiber weight in a wet lay-up, without any vacuum pressure. The total weight was 14 pounds for each 40-foot long section. We laid up the side panels with 0.1-inch Douglas Fir veneer sandwiched between layers of 5-ounce woven carbon cloth. In the center area of the 10-inch wide panel, we concentrated further layers of Unidirectional Carbon Tape for an all-up weight of 28 pounds per panel. To consolidate this more complex laminate and achieve a light weight, we used vacuum pressure on the side panels. For temporary clamping pressure, we set up one of the side panels in a simple fixture and held the leading and trailing edges in place with sheet metal screws. Then we installed the sheer web (see photos) and the other internal pieces and parts that support the tangs, hounds, halyards and the other complexities of a modern mast system. The benefit of this new construction approach over the older fold-up method is that you can deal with the interior complexity at your leisure, then complete the mast by bonding the opposing side panel in place. With the mast structurally complete, we needed only to fair in the bonded joints and add some strength on the exterior of each joint with 2-inch glass tape. After final fairing and finishing, our mast weighed 105 pounds. With all the hardware, rigging and halyards in place, the new mast weighs 132 pounds. Best of all were the results. Adagio,with her new mast, took Second Place in the Open Division in the 298 mile 1996 Port Huron to Mackinac race. 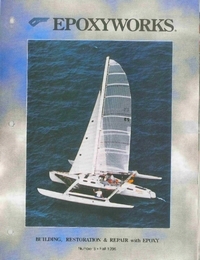 Ray Howe won First Place aboard Earth Voyager, his self-built Walter Greene designed 60-foot trimaran. His boat, built with Gougeon epoxies, was also the first to cross the finish line in a fleet of 268. Adagio was the 12th boat to cross the finish and was up there with fast company in the 50-foot to 80-foot range. Not bad for a 35-foot trimaran in her 26th year. After reconditioning the wing mast, Meade Gougeon sailed his trimaran ADAGIO to 2nd place in the open division of the Port Huron to Mackinac Race. The boat was 26-years-old at the time. Adagio’s hull under construction in 1970. 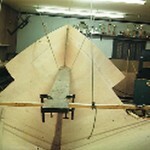 The plywood hull panels are joined at the keel just before folding. 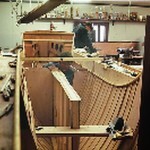 Meade Gougeon aligning the centerboard trunk in the partially completed hull. 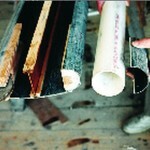 Shear web being bonded to the left side panel. 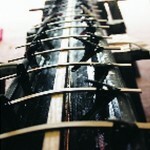 Short,think sticks clamped to the nose and tail sections provided downward clamping pressure on the shear web. A view of the masthead with the shear web in place. The 3″ PVC pipe was used as a mold for the nose and tail pieces. Preparing the right side panel for installation (with interior components in place).